Hitman’s Episode 6, Hokkaido, is elegant, full of possibilities, and leaves players with more questions than answers. It’s a fitting finale to season one of Hitman, because it doesn’t feel like an ending at all. Episode 6 takes place at GAMA, an exclusive and futuristic hospital set in the snowy mountains of Japan. One of the targets is Erich Soders, the season’s loosely-defined villain, who is undergoing heart surgery performed by the hospital’s robotic surgeons. The other target is Yuki Yamazaki, a lawyer for the Yakuza with ties to Providence, the shadow organization that’s seeking to take down 47’s organization, ICA. The hospital is very stylized and pretty. There’s also, as you can see, That One NPC Who Can See Through Every Disguise. You start the level with no gear, a choice that highlights the otherworldly, isolated feel of the hospital. The GAMA facility is at once peaceful and tense, its decadent spa and cliche Japanese gardens standing side-by-side with its high-tech security and patients receiving expensive and not entirely legal procedures. One of GAMA’s most unique features is its door system. There are no keys to find, no locks to pick. Different disguises mingle fairly freely across the level, but only certain ones open certain doors. This is communicated by a symbol on the back of a uniform or outfit that matches the door’s display screen. You can see the door credentials above the panel, and my symbol on the back of my outfit. 47 is not cool enough for this club. It’s a subtle touch, but an elegant one. It gives the sense of restrictions masquerading as privilege, secrets disguised as exclusivity. The hospital is seamless and classic, with doors hidden in walls and lots of glass and gleaming wood, and it encapsulates patients who are some of the most powerful people in Hitman’s world, even if they spend most of their time padding around in bathrobes. GAMA is pretty, weird, and very Hitman. Everyone there has a reason to be where they are instead of somewhere else, making trespassing difficult. At one point, disguised as another patient, I wandered out into the snowy paths surrounding the hospital. A guard caught me, but instead of shooting me on sight he escorted me back into the hospital, condescendingly chiding me for being out of bounds as if goading me to fight back. Everyone knows where everyone else should be, and it makes for a level whose difficulty is a long, subtle burn, rather than the upfront aggression of Colorado. 47 chilling at the spa. Several guests have unique outfits you can don. Of course it isn’t all serious; Hitman excels at moments of levity and randomness mixed in with the murdering. At one point I was dressed as a low-level security guard, and I choked out a doctor to get a certain outfit but forgot 47 can’t wear female NPCs’ disguises. Another character didn’t see me do it, but he saw the body. He yelled that he was going to call for help, turned a nervous circle, and saw me again. Taking me for a guard because of my outfit, he demanded my help, and we fell into a standoff. It was a hilarious little moment that made the level feel lived in and real, both sad and absurd. We’ll have more thoughts on Hitman’s entire first season soon, but it’s hard not to view Episode 6 through the lens of being season one’s finale. It doesn’t feel particularly ending-worthy. The plot is as shoehorned and incidental as ever. Each level’s escalations, contracts, and Elusive Targets have made Hitman feel more like a small universe than an episodic game. The plot hasn’t left much of an impression on me, so my biggest takeaway from Episode 6 was that there wouldn’t be another new Hitman level to play for a while. Until next time, odd jobs. 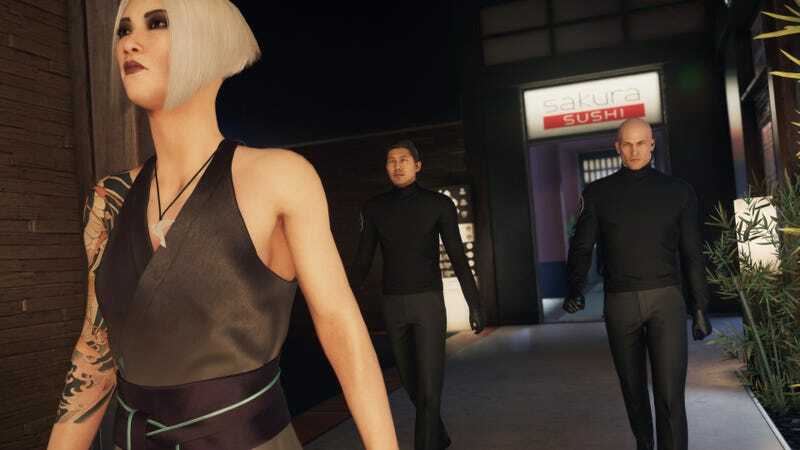 I’ve seen both the good and the bad sides of Hitman’s episodic structure: It’s encouraged me to return to levels I might not otherwise, while also making levels I liked less harder to be patient with. When I finished Episode 6 for the first time, I didn’t sit back with a sense of finality like I often do at the end of games. Instead, I just replanned the mission and dove back in. I have so much more Hitman to explore that Episode 6 hardly registered as a finale. I’m curious how people playing the game as a whole will feel, as opposed to those of us who played it piecemeal. I don’t know if Episode 6 is a great ending, but it’s definitely a great Hitman level.